This is one of my most viewed photos on Flickr – I assume people are searching for it for a simple, cheap, potato recipe. Well, it’s certainly that! It’s a tasty potato soup that in its most basic form only requires five ingredients – potatoes, garlic, onions, vegetable oil and water. You don’t even need to add stock, but seasonings might be needed, depending on your taste. I also added milk and some bacon strips to the top of mine. This soup is also better eaten the next day, and will serve around six. Finely chop garlic and onions together in a processor, then heat the oil in a heavy bottomed pan with a lid, and add the onions. Sweat with the pan covered for ten minutes, then add the potatoes and a cup of water. Bring to the boil, then turn down to simmer. Cover again and leave for 20 mins, checking the water is covering the potatoes. If it’s not, add a bit more. Continue to cook until the potatoes are tender. At this point, you can whizz the soup down to a fine puree or mash it to leave it slightly lumpy. Taste for seasoning. The soup is now done! Garnish with snipped bacon, as in the pic, or maybe with some chives. Or leave plain! 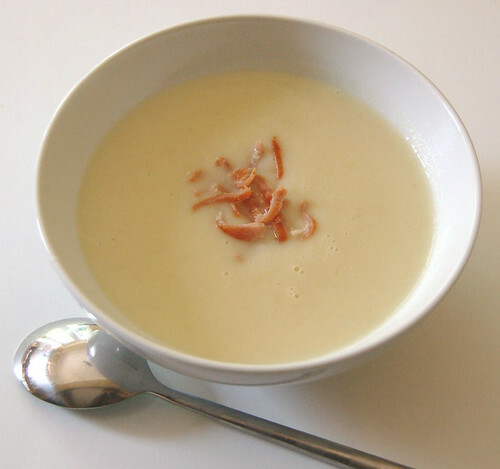 If you eat the soup the following day (recommended, as all soups gain more flavour the day after) then add some more water or milk as the potato tends to make the soup more solid the longer it sits.